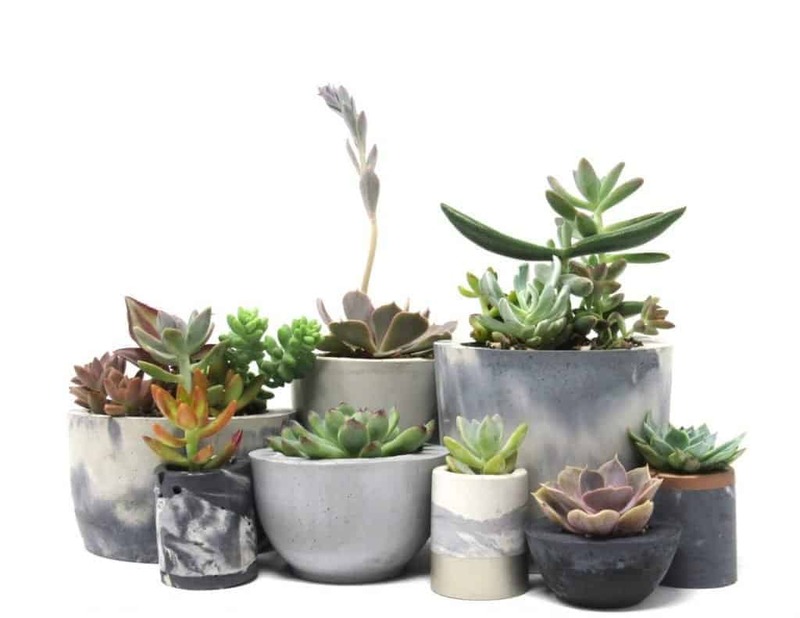 Choosing the correct pot size for your plant can be a complicated task, especially if you are new to succulent care. A pot that is too big or too small can have a major impact on the health of the plant. However, once you understand how pot size affects the plant, you’ll be able to choose the appropriate size with ease. The only thing you’ll have to worry about is if the container matches your décor! Many succulents and cacti have a basic root structure that consists of a central taproot and thinner hair roots sprouting out from the base of the plant. The taproot typically reaches deep into the ground to draw out moisture and anchor the plant. The smaller roots stay closer to the surface to quickly absorb moisture and nutrients near the surface. If your particular plant has this type of root system, keep this structure in mind when choosing the shape and size of the container. A pot that is too small for a plant can be a detriment to the plant’s health. If the roots become constricted due to the small pot size, the plant may not grow as quickly as it should. It can also limit the size of the succulent at maturity. Smaller pots will also be able to hold less soil. This means fewer nutrients are available for the roots to absorb. These problems also apply to containers with too many plants in them. However, you can use this to your advantage if you plan on creating living walls or picture frames. While you don’t want a pot that’s too small, you also want to avoid pots that are too large for your plant. 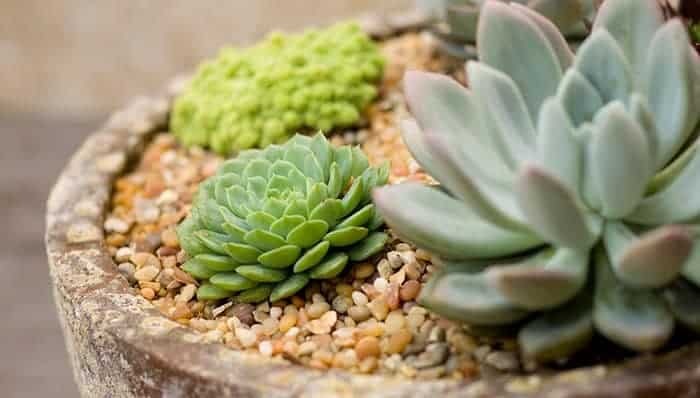 It may seem like a brilliant idea to give the plant plenty of space to grow, but ‘overpotting’ can result in an unhealthy or even dead succulent. If the pot is too big, the soil will be able to hold more water for longer periods of time. Over time, the roots will rot due to the excess moisture. With larger pots, it’s especially important to monitor the amount of water and the frequency of watering. The depth of the pot is also important to the well-being of your succulent. Avoid pots that are too tall or deep because of the amount of soil they contain. As with pots that are too large in diameter, pots that are too tall will retain too much moisture. You want enough room for the taproot to grow, but not so much room that the soil won’t dry out. Succulents and cacti generally prefer shallower containers, which dry out more quickly, resulting in healthier and happier plants. Many expert gardeners recommend using a pot that is approximately 10% larger in diameter than the plant at its widest point. For example, if your succulent is about 4” across at its widest point, you should look for a pot that is about 4.5”-5” in diameter. This includes both the above and below ground portions of the plant! An appropriately-sized will allow the succulent enough room to grow, without crowding the roots or having too much soil. When planting succulent cuttings, be sure to use an especially shallow container. Cuttings can be damaged if planted too deeply or given too much moisture. You may find that especially small pots will work best for cuttings. When choosing your pot, consider how many plants you plan on keeping in the same container. If you would like to plant a variety of succulents or cacti in the same container, use your best judgement to estimate how much room to allow each plant without crowding. Most succulents and cacti need a considerable amount of sun, so be sure to allow enough room for each plant to receive enough light without blocking any of the others. You may need to rearrange them to achieve the most functional layout. If you do choose to plant multiple succulents in the same container, consider the speed at which the plants grow. Although succulents are not known for their quick growth, some varieties do grow slower than others. Take this into account when choosing your pot. Allow each plant enough space to grow at their own rate. If you notice that some plants are being crowded, consider transplanting them into their own container. However, if you want to limit your plants’ growth, in a living wall, for example, planting them closer together will prevent them from outgrowing your arrangement. The proper pot size for a plant will change as the plant grows. As it gets bigger, you may need to transplant the succulent into a larger pot. When transplanting, it’s recommended to use a pot 1-2” larger in diameter than the previous pot. This should allow the plant to grow, without risking its health with too much soil and moisture. No matter what size or shape of container you choose, be sure that it allows for proper drainage. A pot that doesn’t allow excess moisture to drain out the bottom may retain too much moisture and cause your plant’s roots to rot. 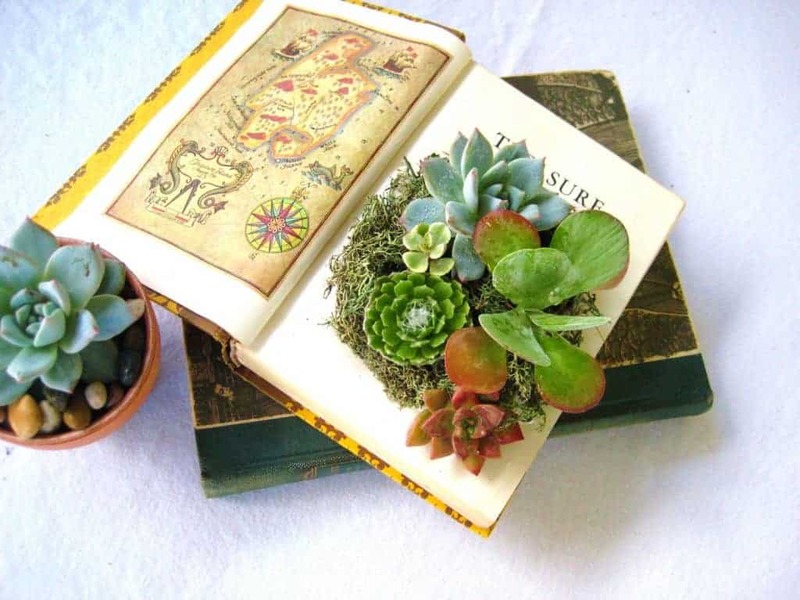 Using a soil intended specifically for succulents and cacti will also help to drain excess moisture. It’s also important to consider the material the pot is made of and how it will affect the plant. Terracotta and ceramic containers are popular choices but heat up quickly in direct sunlight. This can dry out the soil before the succulent has had a chance to properly absorb enough moisture. Wooden containers stay cooler in direct sunlight but may retain too much moisture in the shade or in cooler weather. Metal containers are generally not recommended for long-term use as they can rust. Consider where you’ll be keeping your plants and what material would be ideal for that location when picking out the perfect pot. Your local nursery or garden center will likely have a large selection of pots and planters to choose from. Online retailers are also great places to find containers of all shapes, materials, and sizes. 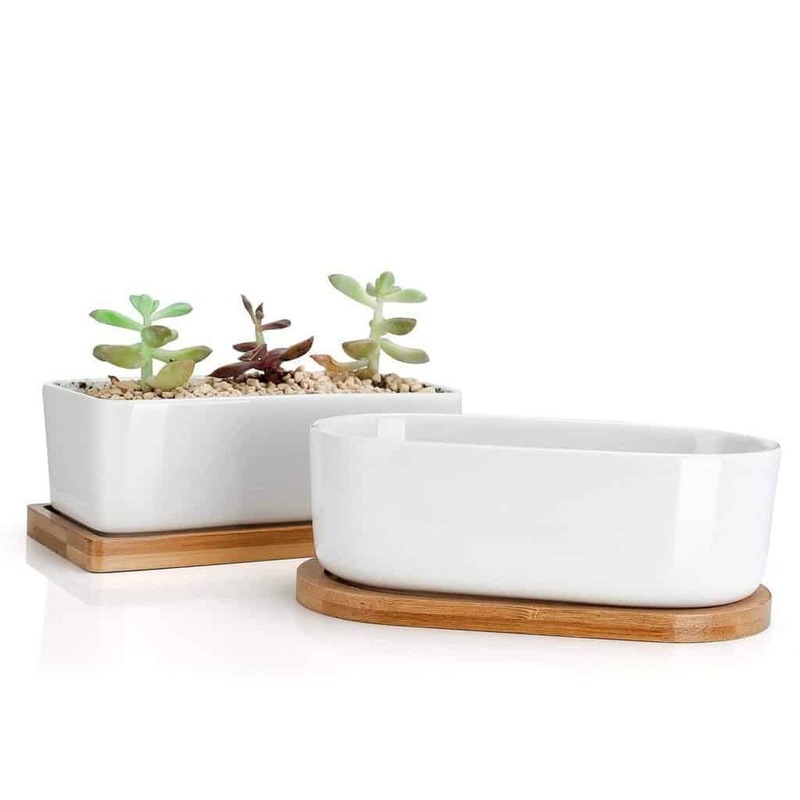 One of the best places to shop for succulent pots, however, is Amazon due to the sheer number of options (and competitive prices). I like to look at bonsai pots – they fulfill all of the requirements for a succulent pot and come in interesting shapes! Grab this and more like it at Amazon! Click the pic! Have any tips for correctly potting succulents? Let us know in the comments!